The sharing of sensitive data across departments, within group companies, externally, and across national boundaries is increasingly subject to legislation. In addition, enforcing governance of data subject to such requirements is increasingly challenging, costly and time consuming; with the processes often manual and disjointed; increasing the risk of breach, fines and loss of reputation. The rules governing data are automatically adhered to at access time. Control of data remains fully with the sovereign data owner. Data Access is fully audited across the organisation. Are you thinking about moving to the public cloud to save on costs? To be more agile? To be more innovative? You are not alone. Organizations around the world are migrating to the cloud at a rapid clip, with some estimates suggesting 80% of all IT budgets will soon be committed to cloud solutions. Many who have started on their cloud journey have realized that it isn’t as easy and inexpensive as they thought. Cloud pricing models can be difficult to decipher and control, applications need to be rewritten, and once re-written those applications are typically locked to a particular cloud. Thankfully, with the right technology in place your cloud journey can go from bumpy and expensive to smooth and contained. How agile is your data? - Cloud enable your legacy systems? - Act locally, but learn globally? - Take advantage of a cloud service whilst eliminating the data silos? Most global organisations are trending on multi-cloud strategies for many reasons including avoiding cloud lock-in to increasing agility needed for innovations. A next generation of a data architecture is a key enabler. Is Your Data Ready for GDPR? As the deadline for GDPR approaches, it is time to get practical about protecting personal data. We break down the steps for turning a data lake into a data hub with appropriate data management and governance activities: from capturing and reconciling personal data to providing for consent management, data anomyzation, and the rights of the data subject. A smart approach to GDPR compliance lays a foundation for personalized and profitable customer and employee relations. - Master compliance operations - from data inventory to data transfers to individual rights management. Introducing data-driven strategies into your business model alters the way your organization manages and provides information to your customers, partners and employees. Gone are the days of “waterfall” implementation strategies from relational data to applications within a data center. Now, data-driven business models require agile implementation of applications based on information from all across an organization–on-premises, cloud, and mobile–and includes information from outside corporate walls from partners, third-party vendors, and customers. Data management strategies need to be ready to meet these challenges or your new and disruptive business models will fail at the most critical time: when your customers want to access it. 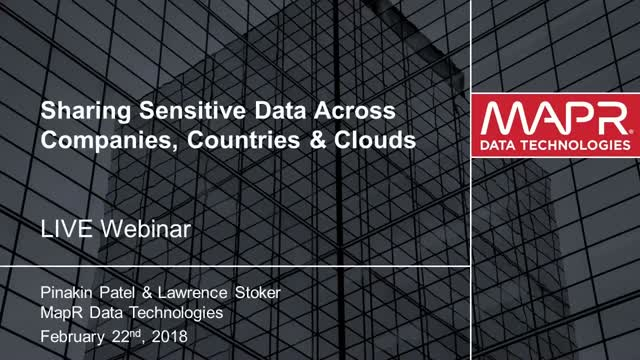 In this webinar, John L. Myers of Enterprise Management Associates (EMA) and Jack Norris of MapR will discuss how the new business advancements require data-rich applications that enable global, real-time data integration, microservices support, and in-place and continuous machine learning/AI and SQL capabilities. Watch this webinar to hear Ted cover multi-model comparison, how rendezvous helps you handle metrics, and how it provides query-by-query comparison. A key issue for real world success that is often overlooked by data scientists is latency and system reliability. Conversely, accuracy is often difficult for SysOps team members to address. The rendezvous approach has a built-in way to include latency and accuracy as systematic parts of evaluation, thus addressing key concern of all parts of a DataOps team. Finally, hear Ted discuss how the containerization of models and system components in a rendezvous architecture makes security auditing easier. Machine learning (ML) and artificial intelligence (AI) enable intelligent processes that can autonomously make decisions in real-time. The real challenge for effective ML and AI is getting all relevant data to a converged data platform in real-time, where it can be processed using modern technologies and integrated into any downstream systems. Running a business in real-time means being able to react to important business events as they happen. Applications that support day-to-day operations, however, are often scattered across the organization making it difficult to enable real-time movement of data. With the growing number of data-driven organizations new approaches are needed to drive innovation in scaling and implementing data science. We will discuss how data and data science platforms take advantage of what we are calling DataOps. We will share background on this approach and how it supports putting data science models into production. We will provide best practices and a roadmap on how to implement these techniques to become a leader in machine learning and data science. - Hear how customers of MapR and DataScience.com have reaped the benefits of this new approach. The use of an emerging data fabric, offers enterprises a number of benefits and advantages including the ability to break through the gravitational pull of legacy data architectures and capture the full potential of all your data. * IoT through a data fabric’s capability of handling data flows from the edge to the cloud, centralizing learning, and distributing intelligence back to the edge for real-time responsiveness. * Microservices and containers with the underlying data fabric able to support intelligent streams and support the mobility and flexibility for elastic stateful applications and analytic processes relying on shared data. How to use streaming, containers and a microservices design. Having heard the high-level rationale for the rendezvous architecture in the introduction to this series, in this session we dug in deeper to talk about how and why the pieces fit together. In terms of components, we covered why streams work, why they need to be persistent, performant and pervasive in a microservices design and how they provide isolation between components. From there, we talked about some of the details of the implementation of a rendezvous architecture including discussion of when the architecture is applicable, key components of message content and how failures and upgrades are handled. We touched on the monitoring requirements for a rendezvous system but will save the analysis of the recorded data for later. At the end of this workshop, you should have a clear understanding of the fit and finish between the parts of the rendezvous model and should be able to evaluate its applicability in your situation. Listen to Ellen Friedman, co-author (with Ted Dunning) of a new short O’Reilly book Machine Learning Logistics: Model Management in the Real World, to look at what you can do to have effective model management, including the role of stream-first architecture, containers, a microservices approach and a DataOps style of work. Ellen will provide a basic explanation of a new architecture that not only leverages stream transport but also makes use of canary models and decoy models for accurate model evaluation and for efficient and rapid deployment of new models in production. Data warehouses have been the standard tool for analyzing data created by business operations. In recent years, increasing data volumes, new types of data formats, and emerging analytics technologies such as machine learning have given rise to modern data lakes. Connecting application databases, data warehouses, and data lakes using real-time data pipelines can significantly improve the time to action for business decisions. Connect your databases, data warehouse, and data lake without code: StreamSets can help you connect your existing databases and data warehouse with the MapR Converged Data Platform to create a modern data lake. You can offload/move data without having to write a single line of code as well as continually monitor and visualize your dataflows. Utilize change data capture (CDC) for efficient real-time data movement: No more analyzing stale data or reliance on batch database updates. Leverage CDC to continually update the MapR data lake and ensure your insights and action are based on complete and current data. Effectively analyze frequently changing data: MapR Converged Data Platform is built on a read-write file system unlike other big data platforms. Land frequently changing data into MapR-DB and analyze it using modern distributed computing technologies. All Data. One Platform. Every Cloud. Limitless Possibilities. Data is changing the world. Data is everywhere. Digital and business transformations are underway to harness the power of data. We believe that data is now a company’s most important asset. Businesses must use all data, while being nimble and agile to create new opportunities, products and services. A new generation of intelligent and modern apps are characterized by using data of all types, many processing engines, and being able to do analytics and applications, together, as the data happens. Last gen and even newer technologies cannot meet these new data demands. A unique and groundbreaking approach is needed which combines essential new technologies with one platform for all data that creates a data fabric for companies to build great new products. MapR Data Technologies, a visionary Silicon Valley based enterprise software company, has pioneered one platform for all data in every cloud. This approach is the industry’s first modern data system. At the core is the MapR Converged Data Platform that enables simultaneous analytics and applications as data happens so companies can create new, intelligent and modern apps to outperform the competition.